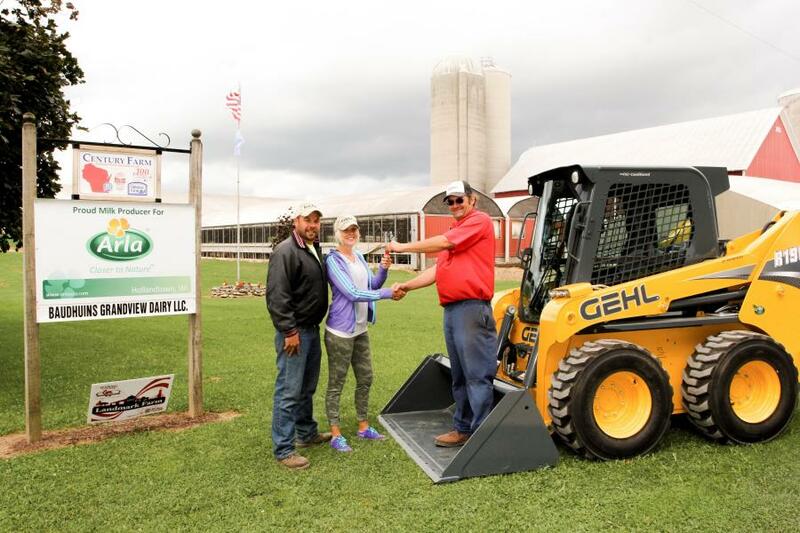 Luxemburg Motor Company delivers Gehl R190 to Baudhuin Dairy Farm. From left: Rob Baudhuin, Tammy Baudhuin and Dean Massart. A brand new Gehl R190 Skid Loader was delivered to Baudhuin's Grandview Dairy LLC in Casco, Wis. for the farm to use free of charge for three months or 150 hours, whichever comes first. Baudhuin's Grandview Dairy entered into the Gehl R190 Giveaway drawing at this year's Wisconsin Farm Technology Days in Kewaunee County. Several family members of Baudhuin's Grandview Dairy were involved in the event and were there volunteering. Luckily, they still found time to stop by the Gehl booth where they entered the drawing, and it was quite a surprise to them when they were announced the winners. "Our thirteen-year-old son, who loves farming, was ecstatic when he found out we won," said Tammy Baudhuin. "He went with us to Farm Technology Days and was so excited to see all of the equipment and stop by the booths. He put our farm in the drawing and was thrilled to hear we won!" The machine was delivered to the local Gehl dealer, Luxemburg Motor Company, who then delivered it to the farm. Baudhuin's Grandview Dairy and Luxemburg Motor Company have a long-standing relationship that they describe as being like a family. The farm was started in the early 1900s by Louis and Agnes Sisel and has remained in the family for four generations and running. They have been loyal customers of Luxemburg Motor Company since it was opened in 1961 by Wilfred Massart. The reigns have since been passed down to brothers Dean Massart and Dennis Massart, Jr.
"Baudhuin's Grandview Dairy is a deserving recipient of the Gehl R190 Giveaway," said Dennis Massart, Jr., co-owner of Luxemburg Motor Company. "We have worked with them since the 1960's, and they have always been a great customer." The top-quality power and performance of the Gehl R190 Skid Loader is ideal for farm applications. Its key features include a 69.9-horsepower engine, 1,900-lb. operating capacity, 120.5-in. maximum lift height, superior safety elements and various attachment options. "We currently have six Gehl skid loaders on our farm," said Rob Baudhuin. "We like the operator controls, reliability and ease of operating them. We can also get service seven days a week from Luxemburg Motor Company." Baudhuin's Grandview Dairy spans across 2,400 acres in Kewaunee County. They have approximately 600 milking cows and plan to use the skid loader to feed the herd and prepare bedding. Luxemburg Motor Company has been a trusted Gehl dealer for over 50 years. They currently offer Gehl articulated loaders, skid loaders and track loaders, as well as Manitou telehandlers at their location at 925 Main Street in Luxemburg, Wis. For more information, visit luxemburgmotor.com or call 800-591-1864. For more information on Gehl products and services, visit gehl.com.